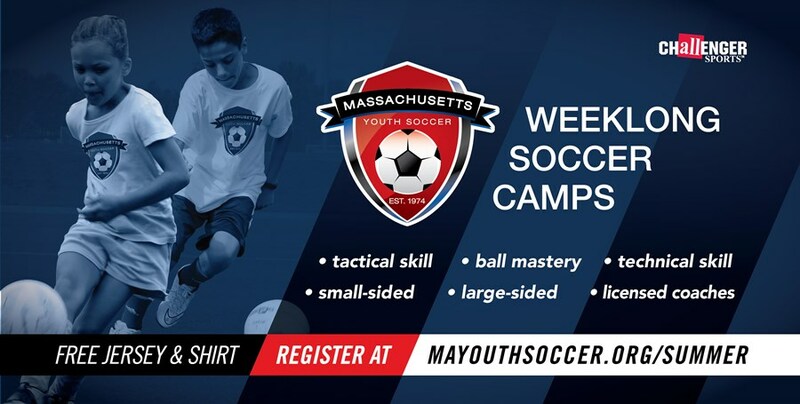 Massachusetts Youth Soccer Camps is excited to have partnered with Challenger Sports to offer Summer Programs for players of all ages and abilities this Summer. Our new week-long camps have been designed to follow US Soccer best practices for player development and fit busy the schedules of active families. The camp curriculum for all ages will follow a Play – Practice – Play format incorporating activities that include periodization to sustain and optimize each player’s performance throughout the duration of the camp. All of our camp staff hold US Soccer National Licenses and have undergone extensive training on how to improve youth soccer players using empowerment and inclusive training methodology. Massachusetts Youth Soccer will partner with Challenger Sports to offer these programs to players in the Massachusetts soccer community. All camp participants will be provided with a unique environment that will develop their technical and tactical soccer skills over the course of five days, through individual ball mastery, small and large sided games.